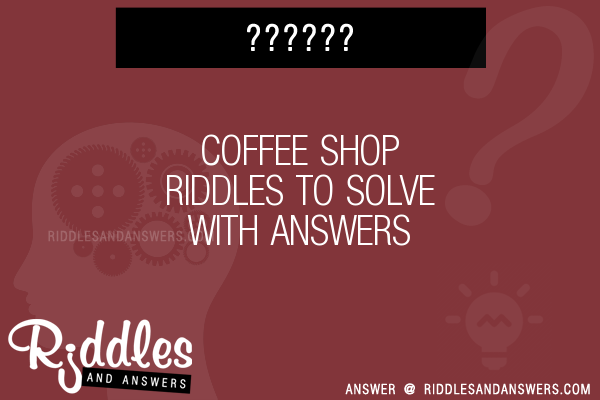 Here we've provide a compiled a list of the best coffee shop puzzles and riddles to solve we could find. The results compiled are acquired by taking your search "coffee shop" and breaking it down to search through our database for relevant content. Ida puts her coffee into the microwave, as she does every morning, for exactly two minutes. When the microwave goes off, she opens the door, but then closes the door again and sets the microwave for two more seconds. What good would two more seconds be? To rotate the handle on the mug so she can comfortably remove it. A man walks into a diner and sits down. There's a new waitress working that he's never seen before. When she comes to his table to take his order, he says "Just a cup of coffee please." A few minutes later the waitress brings the man his coffee and heads back to the kitchen. A short while later, the man notices that there is a fly in his coffee and calls the waitress back. He asks her nicely to bring him another cup. The waitress brings the man's cup of coffee back to the kitchen and returns a few moments later. "Here you are, I poured you a new cup of coffee, no fly this time" she says and hands him the cup. The waitress turns around and starts to head back to the kitchen. She only takes a few steps before she hears the man shout out "Hey, this is the same cup of coffee, all you did was remove the fly!" Assuming the coffee was still hot, how did the man know it was the same cup of coffee? Because the coffee was sweet. The man had added sugar to his coffee before noticing the fly. When the waitress brought him the "new" cup of coffee, he took a sip (to check whether it was in fact a newly poured cup of coffee) and noticed that the coffee was "already" sweet. George, Helen, and Steve are drinking coffee. Bert, Karen, and Dave are drinking soda. Why is coffee like an axe with a dull edge? Because it must be ground before it is used. Because according to the Torah He Brews! What's fat, hairy and drinks a lot of coffee?